Being truly bi-literate, not just bi-lingual, is a key advantage in our global society, and provides many benefits that extend beyond language learning. At the core of the Manitou School’s mission is the desire to develop students’ abilities to learn and communicate in a second language, and to develop their second language competencies so that learners become bi-literate contributing members of a global society. The Manitou school is guided by the Standards for Foreign Language Learning in the design of the curricula and in the professional development opportunities offered to our staff. 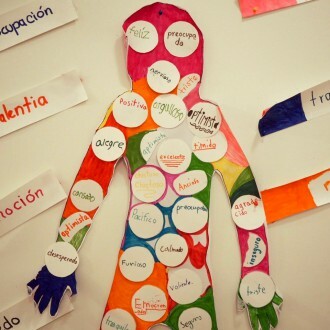 Our world language curriculum uses the Five C’s of Foreign Language Education: Communication; Culture; Connections; Comparisons; and Communities. We have found that second language acquisition occurs seamlessly within our interdisciplinary units of study. Students participate in Spanish instruction on a daily basis. We infuse Spanish into class meetings, physical education, and areas beyond the classroom.